David Ospina has been discharged from hospital and given the all clear after collapsing during Napoli's Serie A match on Sunday. 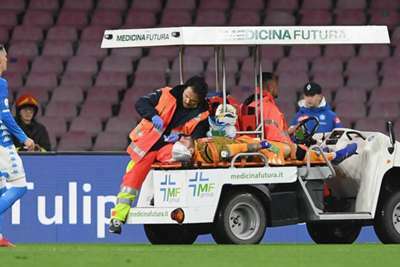 The Colombia goalkeeper underwent a scan after cutting his head in a collision with Udinese winger Ignacio Pussetto at Stadio San Paolo. Ospina, who is on loan at the Serie A side from Arsenal, received treatment on the pitch and initially played on before collapsing just prior to half-time. The 30-year-old spent the night under observation and Napoli confirmed further tests came back clear. Ospina has withdrawn from his country's upcoming friendlies against Japan and South Korea as a precaution. "David Ospina was this afternoon discharged from the clinic where he had been admitted last night for a series of investigations and specialist visits," read a Napoli statement. "All tests are negative. The visits [ruled out] any problems. "The player has been advised to have a few days off and will not respond to the call-up of his national team."